Over the last two years, I have had the unique opportunity to serve as a mentor-coach for three Jewish early childhood education (ECE) centers in the Denver area that participated in BUILDing Jewish ECE, an innovative capacity-building initiative sponsored by Rose Community Foundation. As shared previously, the initiative was designed to help synagogues and JCCs with ECE centers increase enrollment through enhanced marketing communications, improved enrollment conversion skills, and focused efforts to engage Jewish families and build stronger connections to the Jewish community. What knowledge do my schools have in the areas we want to develop? How will I help coach them to develop new knowledge and skills? How can I help them evaluate their development and improvement? Once I leave, can they continue to move forward on their own? For many ECE professionals, marketing and enrollment conversion are underdeveloped or entirely foreign skills. In order to help a center progress in these areas, it is important to determine accurately the center’s current performance marketing their center to generate inquiries and enroll new families. Having a road map that shows how competence can be built over time with specific behaviors that lead to improved performance is critical. And this is why the “Standards of Excellence for Jewish Community Centers and Synagogues with Early Childhood Education Centers“ – designed in large part by the coaches and consultants in BUILDing Jewish ECE – is such a pertinent and useful tool for anyone who wants to elevate their work in this space. With standards in 15 areas to assess and improve quality ECE centers, the SOE is extremely thorough and comprehensive. As a mentor-coach, I appreciate the flexibility to select which standards need strengthening. For BUILDing Jewish ECE, for example, we focused on marketing communications, enrollment conversion, and family engagement. Within each of these areas there are multiple standards. Once we completed our scoring in standards, the center leadership and I identified the specific standards that we wanted to focus on for the coming year. 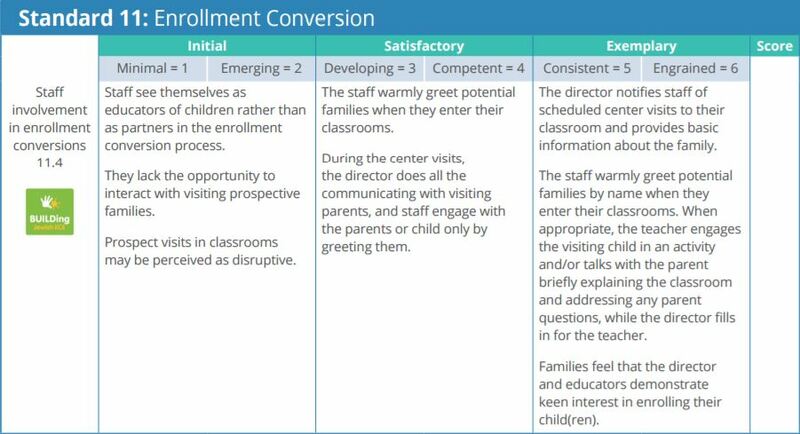 Knowing that it is overwhelming to focus on too many areas simultaneously, we chose two to four standards in each of the three domains of Marketing, Enrollment Conversion and Family Engagement. Using the performance level description as a guide, the center director and leadership team developed action plans to improve or enhance their center’s performance. As a consultant and manager of early care and education programs, I have found that developing action plans is a critical step that many schools often want to skip. Yet, in my experience, organizations that write goals, develop written action plans, and identify specific actions with completion dates that are assigned to specific team members have a higher probability of success. As mentor-coach for the center, I assisted them in developing an action plan for each of the three areas; the center plans then were shared with the project director and the evaluator of the BUILDing initiative. Throughout the year, the director, leadership team and I reviewed the action plans together to chart progress. Action plans should remain flexible to accommodate setbacks, changes in course and early completion of actions. As we completed tasks, new actions were identified and added to the action plans. A key requirement of the nine centers that participated in BUILDing Jewish ECE was to establish a leadership team, known as the BUILD Team, to assist in developing the action plans. BUILD Team members included the center director, the director’s supervisor, members of the organization’s senior leadership team including clergy, lay leaders, parents and teachers. With a diverse team with varying levels of experience in marketing, enrollment conversion and family engagement, team members need a common language to use. The SOE offers clear language and a framework for approaching this work, so the team could understand and successfully communicate how quality and competence improves and builds over time. Along with other coaches, we held five BUILD IT Seminars to train all the BUILD Teams in identified areas of need. The SOE served as the guide during these training seminars, offering a common reference point for everyone. This meant that although each center focused on different standards in their action plans, the teams were able to effectively share knowledge, discuss lessons learned, and understand how achieving higher performance in one standard often improved their execution with other standards. The interaction was essentially watching, live and in-person, the maturation of the Jewish ECE field. Finally, at the end of the first year working with the BUILDing Jewish ECE centers, we rescored the SOE and compared that score to the initial scoring. It was easy for participants to measure success the center had achieved. They were excited to see the growth in the center’s performance in the standards they had selected. They also were quick to identify areas where further development was still needed. Often there was improvement in standards that had not been identified and written into their action plans. This was due to training, coaching, and heightened awareness of layered behavior changes needed to improve in other standards. Then, at the culmination of the two-year initiative, the standards were scored and actions plans were developed to continue the growth in competency and excellence into the future. Each center now has the SOE publication and can continue to assess and improve selected areas. And, thankfully, any ECE center can access and use the Standards now as well. As a mentor-coach—and as an unabashed cheerleader of Jewish ECE—this is an exciting development. With a common language, common benchmarks, and numerous best practices to model, centers are positioned to increase their effectiveness and to advance the field of Jewish ECE. Karen Stokes, President of K. King Consulting, LLC focuses on “Leadership and Management Solutions for Early Childhood Education.” Karen has extensive experience in early childhood as a teacher, director, multi-unit manager and president of programs throughout the United States. Karen is a resident of Colorado and may be reached at karenstokes1031@gmail.com. Access the Standards of Excellence here. NextHebrew Language Academy Awarded “Facing History and Ourselves” Grant.